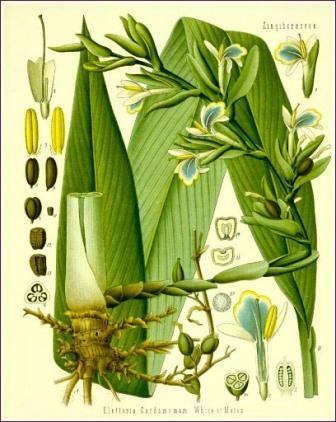 Cardamom is one of the natural remedies for indigestion. It is a medicine herb native to Southern China and Vietnam. The spice form is grown in India and Sri Lanka. It is a perennial that can grow to a height of fifteen feet with mauve/white flowers and lance shaped leaves. The seed pods of cardomom are the part of the plant used medicinally. The main treatment it is used for is indigestion and heartburn. Why is this important? Chronic acid indigestion can inflame the lower end of the esophagus..even if you can't feel it all the time. This inflammation leads to a condition known as Barrett's Esophagitis and if left untreated eventually can cause esophogeal cancer. So treatment of chronic indigestion is perhaps, more important than you thought. Tuburculosis.Increases the effectiveness of streptomycin against tuberculosis. Urinary incontinence. Used in Chinese medicine to stop incontinence. Indigestion. A natural remedy for heartburn that prevents indigestion. Ulcers. Prevents indigestion and allows ulcers to heal. This herbal remedy can be used as a tincture or a tea. Also, the spice can be used IF it is fresh. If you are already taking an H2 blocker or any medication for ulcers or indigestion, please discuss this with your doctor.